You can now try resizing the buttons to how you want them and you can change their captions to be more descriptive like the image below shows. The form's size and caption can also be changed. It is important to note that if you change a control's Name you must change the coding associated with it accordingly. 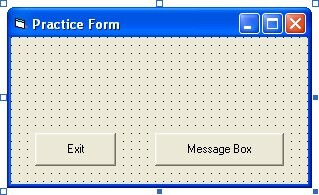 For example, if you were to call your first button "MessageBox", its code must be changed as shown below, otherwise it will not work.